Lot Size One is a concept from Pharma 4.0 theory – that in that age of connected data, an individual customer order need no longer be satisfied from stock in the supply chain but might actually trigger a production machine to produce that specific item. 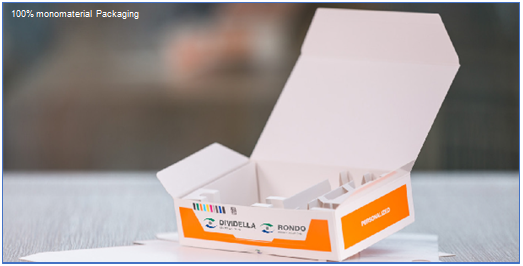 Dividella’s Lot Size One and Up approach, also rooted in 21st century production and packaging concepts, adopts a robotic work-cell system to boost the flexibility and sustainability of small-batch production. In the 21st century, however, the advent of leveraged data, combined with modern lean production and just in time manufacturing/supply concepts are allowing pharmaceutical companies to square the circle: moving towards smaller batch sizes while simultaneously maintaining ready supply. The trend to small lot production is driven not just by capability but by need: rising demand for personalized medicines, desire to get product to market quickly after successful clinical trial and the reality that most drugs and medical devices are no longer sold in bulk. Each work cell can be equipped, depending on the production configuration needed, with supply units that are exchangeable in a plug-and-produce manner. Dividella caters to pharmaceutical manufacturers that are looking to produce small batches – down to individual units – more efficiently with its upcoming system, which has been designed for the semi and fully automatic packaging of vials, syringes, auto-injectors and other parenteral products. Additionally, existing data from an upstream process like filling or inspection can be merged with new data from the line and transferred to the next downstream process, such as case packing or logistics. Serialization and aggregation are supported as well. “We aim to deliver full product and data transparency with future machines that know how many products were delivered, when the batch was produced, and can state how many were packed and what percentage may have been rejected and why,” says Mr. Huber. “We feel that we have to offer the pharmaceutical industry equipment that is more sustainable, without compromising on flexibility,” Manuel Huber concluded. Click on The Dividella approach to small-lot production for other information.